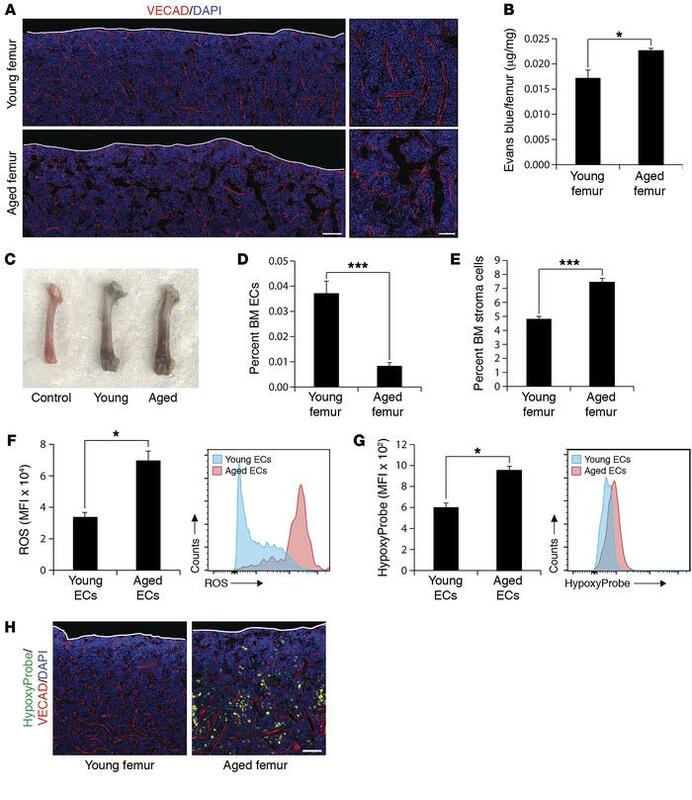 Aged BM vasculature displays functional alterations in vivo. (A) Representative longitudinal and inset images of femurs intravitally labeled with a vascular-specific VECAD antibody (red), showing morphological alterations in aged vasculature (white line demarcates cortical bone). Scale bars: 100 μm (longitudinal images) and 50 μm (insets). (B and C) Analysis of BM vascular leakiness in young and aged femurs. (B) Quantification of Evans blue dye extravasation (n = 5 mice/cohort). (C) Representative femurs injected with Evans blue dye. Noninjected controls were used to determine baselines (n = 5 mice/cohort). (D and E) Frequency of recoverable (D) VECAD+CD31+CD45–TER119– BM ECs and (E) VECAD–CD31–CD45–TER119– stroma in young and aged femurs (n = 5 mice/cohort). (F) Quantification of mean fluorescence intensity (MFI) and representative histogram of ROS in VECAD+CD31+CD45–TER119– ECs from young and aged femurs showing an increase in ROS in aged ECs (n = 3 mice/cohort). (G) MFI quantification and representative histogram of pimonidazole adducts as detected by an anti-pimonidazole antibody (HypoxyProbe) in VECAD+CD31+CD45–TER119– ECs from young and aged femurs, demonstrating an increased hypoxia state in aged ECs (n = 3 mice/cohort). (H) Representative immunofluorescence images of HypoxyProbe-stained young and aged femurs, showing local changes in hypoxia (white line demarcates cortical bone). Scale bar: 50 μm. Error bars represent the sample mean ± SEM. *P < 0.05 and ***P < 0.001, by unpaired, 2-tailed Student’s t test.